The fluoride in the toothpaste becomes less effective as it does not bind well to tooth enamel, thus it loses its ability to brush away the bacteria in the mouth and protect against cavities. Ingredients start to separate, including the flavoring so it becomes quite unpleasant to your taste buds. 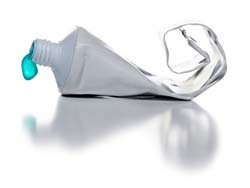 Toothpaste may just become too dried out and hard to squeeze through the tube. So, what do you do with an expired tube of toothpaste? Definitely don’t throw it away, surprisingly; there are a ton of uses for toothpaste outside of the mouth. Here are just a few ideas we found when we Googled “uses for toothpaste”. Please note, these tips only work with paste not gel. Clean the bathroom sink – Toothpaste contains tiny, natural abrasives, such as silica that work great on shining up your sink, including the faucet. Remove odor from hands – The same ingredient that freshens your breath will also remove unpleasant odors from your hands. Just use it that same way you would use hand soap. Remove crayon marks from walls – The mark of every home with a toddler, crayons on the wall. No problem, just squirt a little toothpaste on the walls and scrub with a brush or micro-fiber cloth. Viola – gone. Clean a clothes iron – To clean that gummy residue that occasionally builds up on your iron, just scrub it with some toothpaste. Those little abrasives come in handy again. Just make sure to do this on a cool iron. Remove scuffs from leather shoes – Out of shoe polish right before the big date? No problem, just grab your toothpaste, put a dab on your shoes. Rub with a soft cloth then remove with a damp cloth. Your shoes will look brand new. So, now you know, toothpaste does expire and there are some handy things you can do with expired toothpaste. These are just five of the many ideas out there. Let us know if you have any ideas you could add to this list.